When I click the Preview Now button to check the live preview of my variation, the Preview Mode window that displays the preview does not appear. 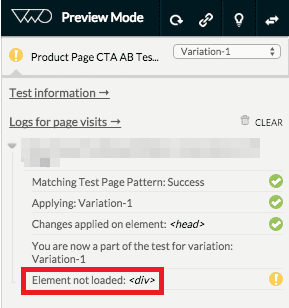 Make sure that VWO tracking code is correctly installed on the test page. 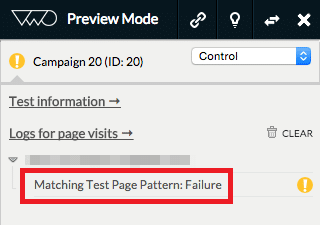 The only scenario where preview debugger does not appear is when VWO tracking code could not be executed on the page. It could be possible that the tracking code is not present on the webpage or has some syntax errors due to which it does not gets executed successfully. Clear the cache and all the cookies of the browser from Browser settings and then re-load the previews. If the Default URL does not match with URLs on which test is running then the previews would not load. 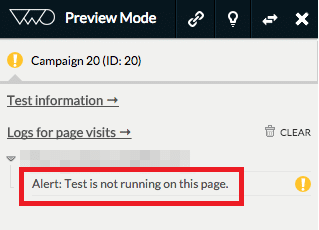 If you want to run the test on different domains (either test URLs or goal URLs) and you have not enabled the Campaign involves multiple domains option in the settings. Please make sure cross domain tracking is enabled as explained in the article. If the test has any regular expression added either as test URL or a goal URL, then make sure that it does not have any syntax error. If the landing URL does not match with URLs included in VWO, then an error message will appear. If you are using a wildcard pattern or regular expression then make sure to include the URL for the preview. Also, check for https and http within the URLs to ensure that the same protocol is mentioned in VWO test as well as the landing URL. When you apply a change in a webpage using VWO editor, it saves the CSS selector path of element on which the change is applied. VWO then tries to find the element on live website with the same CSS selector path. Make sure that there are no changes from backend in the source code of the page because of which VWO is not able to find the element with specified CSS selector path. Verify if the page is initialized with Dynamic IDs assigned to its elements within the source code. In case of dynamic IDs, the CSS selector path saved by VWO may not be found on the test page as dynamic ID would have a new value. As a solution, you would need to assign static IDs to those elements or use custom JS code via Code Editor to apply the change. We do not recommend using multiple operations on the same element. Refer to the best practices for using VWO editor before applying the changes.